Order No. Description For Stand No. Has rigid construction and fine adjustments, which makes the Comparator Stand suitable as a gaging stand for detector heads of Mu-Checkers. Can mount dial indicators and Hicators. 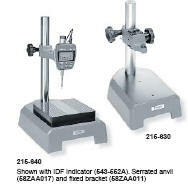 Can be used for measuring roundness and straightness. 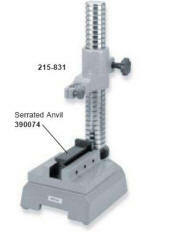 These Comparator Stands use a rigid cast-iron base and a hardened steel anvil and a hardened steel anvil. The flatness of the anvil surface is less than .000008inch /0.2µm, which is suitable for precision measurement with a .000005inch / 0.001mm-resolution Digimatic indicator or Linear Gage. The anvil has grooves in a grid pattern to prevent the work piece from sticking to it. One-piece bracket for high rigidity and easy parallel adjustment. µm, which is suitable for precision measurement with a .000005inch / 0.001mm-resolution Digimatic indicator or Linear Gage.